ACL tears often lead to knee instability, particularly in active people. In the United States, ACL tears are typically treated with surgical repair in active individuals. In both groups, meniscal tears were treated as indicated based on MRI findings and clinical signs. In Group 1, there were 40 meniscal surgeries over the course of the study. In Group 2, there were 50 meniscal surgeries. Findings: In young, active adults with acute ACL tears, a strategy of rehabilitation plus early ACL reconstruction was not superior to a strategy of rehabilitation plus optional delayed ACL reconstruction. The latter strategy substantially reduced the frequency of surgical reconstructions. Because of the high crossover rate (51%), it is not possible to conclude from this study if either approach is superior. In the as-treated analysis, outcomes did not differ, but these types of analyses are often biased. Findings: In this first high quality randomised controlled trial with minimal loss to follow-up, a strategy of rehabilitation plus early ACL reconstruction did not provide better results at five years than a strategy of initial rehabilitation with the option of having a later ACL reconstruction. Results did not differ between knees surgically reconstructed early or late and those treated with rehabilitation alone. These results should encourage clinicians and young active adult patients to consider rehabilitation as a primary treatment option after an acute ACL tear. 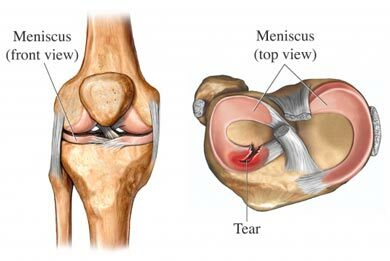 When the meniscus is torn either by trauma or wear-and-tear (see meniscus tear illustration), orthopedic surgeons often "scope" the knee and remove pieces of the torn meniscus. The remaining cartilage is then trimmed back to form a stable rim. The procedure is intended to improve symptoms caused by the torn meniscus (ex. pain, popping, catching, etc.). Arthroscopic partial meniscectomy is the most common orthopedic procedure performed in the U.S.
A subgroup of patients (Group 1 - 14 patients, Group 2 - 18 patients) had acute onset of symptoms. When these patients were analyzed separately, there was no significant difference in their outcomes, although this analysis was underpowered. Two patients in Group 1 required additional knee surgery, and five patients in Group 2 eventually had knee surgery. This difference was nonsignificant. Findings: In this trial involving patients without knee osteoarthritis but with symptoms of a degenerative medial meniscus tear, the outcomes after arthroscopic partial meniscectomy were no better than those after a sham surgical procedure. The FIDELITY study is interesting for a number of reasons. It's rare to see a surgical study where the control group is given a sham procedure, particularly one that is invasive. Arthroscopy without meniscal repair still carries risks (ex. infection, bleeding), and convincing patients to sign up for the trial (and subsequent risks) when they may receive no actual treatment would likely be difficult. The trial is very relevant because arthroscopic meniscal repair is a very common procedure, particularly in the U.S. Patients with osteoarthritis were excluded which means the procedure was only performed in patients who would be expected to benefit the most from the procedure. Other studies on meniscal tears have included patients with osteoarthritis (see meniscal tear in osteoarthritis). The post hoc analysis is intriguing because mechanical symptoms have often been attributed to mobility of the torn meniscus. Meniscectomy did not appear to improve these symptoms. It's important to note that Post hoc analyses have many limitations including loss of randomization and power. Trial excluded patients < 35 years, and average age of subjects was 52 years. It is unclear if results would apply to younger, more active patients. Findings: Resection of a torn meniscus has no added benefit over sham surgery to relieve knee catching or occasional locking. These findings question whether mechanical symptoms are caused by a degenerative meniscus tear and prompt caution in using patients' self-report of these symptoms as an indication for meniscal repair. A follow-up study looked at two-year outcomes from the Fidelity trial. Over two years, only two patients were lost to follow-up. Findings: In this 2-year follow-up of patients without knee osteoarthritis but with symptoms of a degenerative medial meniscus tear, the outcomes after meniscal repair were no better than those after placebo surgery. No evidence could be found to support the prevailing ideas that patients with presence of mechanical symptoms or certain meniscus tear characteristics or those who have failed initial conservative treatment are more likely to benefit from meniscal repair. Osteoarthritis (OA) is the form of arthritis that develops as people age. It occurs from the natural "wear and tear" on joints over time. Because of this, it is normally seen in patients ≥ 50 years, but it may also occur in younger patients who have a history of joint trauma or genetic predisposition. Knee OA is the most common form of OA. The pain of knee OA typically develops gradually and worsens over time. 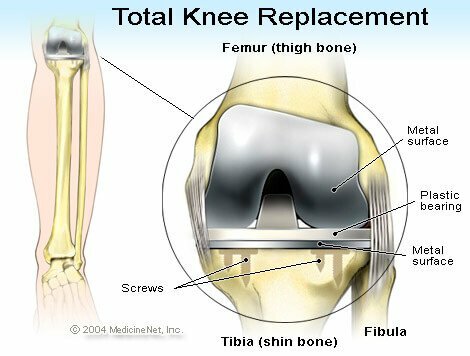 If all the cartilage in the knee wears away (bone-on-bone), then a knee replacement may be necessary to relieve the pain. A common treatment for knee OA is to inject steroids into the knee joint. Theoretically, the steroids suppress inflammation and improve knee symptoms. While this treatment is widespread, several placebo-controlled studies detailed below have found it to be of no benefit. Patients also had MRIs performed at baseline and Week 14. There was no significant difference in MRI-assessed synovitis between the groups. Findings: No additional benefit results from adding an intra-articular injection of 40 mg of corticosteroid before exercise in patients with painful OA of the knee. Further research is needed to establish optimal and potentially synergistic combinations of conservative treatments. Findings: Among patients with symptomatic knee osteoarthritis, 2 years of intra-articular triamcinolone, compared with intra-articular saline, resulted in significantly greater cartilage volume loss and no significant difference in knee pain. These findings do not support this treatment for patients with symptomatic knee osteoarthritis. While popular, steroid injections have mostly fallen flat in well-done, randomized controlled trials. Conscientious patients and providers should largely avoid their use. Another treatment for knee OA is the injection of hyaluronic acid (Synvisc®) into the knee joint. Hyaluronic acid is a gel-like substance that is supposed to "lubricate and cushion" the knee joint. A study published in The Journal of Bone and Joint Surgery that compared hyaluronic acid to steroid injections is presented below. Findings: Triamcinolone acetonide provided similar improvement in knee pain, function, and range of motion compared with hylan G-F 20 at the 6-month follow-up, with better pain control in the first week and better knee functional improvement in the second week. In this study, Synvisc-One® was no better than a steroid injection for knee pain and function at 6 months. Steroid injection was significantly better than Synvisc-One® for pain relief up to 1 week. Glucosamine is an amino sugar that serves as a precursor for glycosaminoglycans, a major component of cartilage. This property is used to promote its theoretical effect in treating OA. Chondroitin is a glycosaminoglycan, a major component of cartilage. This property is used to promote its theoretical effect in treating OA. Findings: A 800 mg/day pharmaceutical-grade chondroitin sulfate is superior to placebo and similar to celecoxib in reducing pain and improving function over 6 months in symptomatic knee osteoarthritis patients. This formulation of chondroitin should be considered a first-line treatment in the medical management of knee OA. Findings: Glucosamine and chondroitin sulfate alone or in combination did not reduce pain effectively in the overall group of patients with osteoarthritis of the knee. Exploratory analyses suggest that the combination of glucosamine and chondroitin sulfate may be effective in the subgroup of patients with moderate-to-severe knee pain. There are three forms of knee replacement surgery. In a total knee replacement (TKR), all articular surfaces of the tibia and fibula are replaced (see TKR illustration). 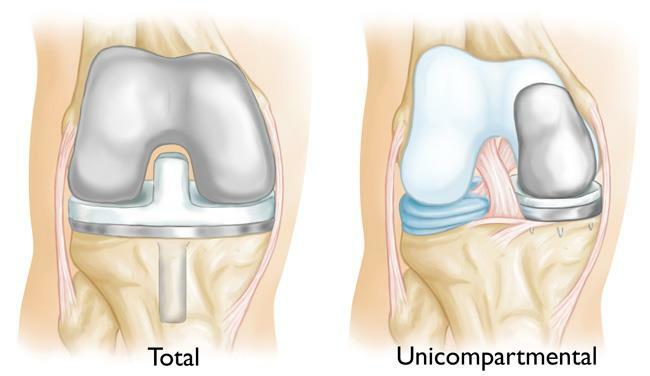 In a unicompartmental knee replacement (UKR), only one side of the knee is replaced (see UKR illustration). 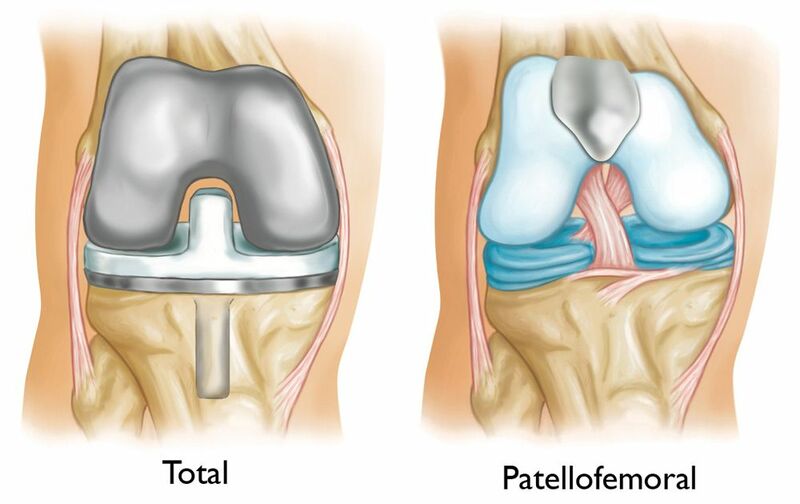 In a patellofemoral replacement (PFR), only the groove in the femur where the patella slides is replaced (see PFR illustration). Knee replacements can fail over time and patients often want to know how long they can expect their replacement to last. Several studies have looked at the durability of knee replacements over time. Results from those studies are summarized in the table below. The Achilles tendon connects the calf muscle to the heel bone (Achilles tendon image). The tendon may become inflamed (tendonitis) from overuse. Achilles tendonitis typically is seen in runners and middle-aged people who play sports. The theory behind the therapy is based on the fact that blood contains a number of cell-signaling chemicals and growth factors. Injecting blood around the inflamed tendon is supposed to stimulate healing. All participants were instructed to do 180 heel drops over a step each day. Subjects were allowed to exercise as long as it did not induce pain. Primary outcome: Change in the Victorian Institute of Sports Assessment-Achilles (VISA-A) score measured at baseline and again at one, two, three, and six months. Scores range from 0-100 with 100 indicating a symptom-free tendon. Findings: The administration of two unguided peritendinous autologous blood injections one month apart, in addition to a standardised eccentric training programme, provides no additional benefit in the treatment of mid-portion Achilles tendinopathy. In general, all types of tendonitis are difficult to treat. While a number of therapies have been proposed, time appears to be the most effective treatment. The rotator cuff is a group of tendons that connect to the head of the humerus. The tendons originate from muscles on the scapula, and they combine to provide stability and motion to the shoulder joint. See rotator cuff illustration. As people age, tears may develop in the rotator cuff tendons. In some studies, up to 30% of the population ≥ 60 years old have rotator cuff tears. Nontraumatic rotator cuff tears typically originate in the supraspinatus tendon underneath the acromion. There are several hypotheses as to why this occurs. Under one theory, the tear occurs secondary to chronic friction between the supraspinatus tendon and acromion. This theory serves as a basis for acromioplasty, a surgical procedure where the bottom of the acromion is shaved off to increase the space between the acromion and the tendon. Other theories suggest that the tear is unrelated to mechanical factors and most likely due to tendon degeneration over time. Primary outcome: Change in the absolute Constant score at 2 years. The Constant score is the sum of four subscores (pain, activities of daily living, range of motion, and strength). Higher scores mean less pain and better function. Scale goes from 0 (worst) to 100 (best). Findings: There was no significant difference in clinical outcome between the three interventions at the two-year follow-up. The potential progression of the rotator cuff tear, especially in the non-repaired treatment groups, warrants further follow-up. On the basis of our findings, conservative treatment is a reasonable option for the primary initial treatment for isolated, symptomatic, nontraumatic, supraspinatus tears in older patients. Elective surgical studies often have high crossover rates which can bias the study findings. This study had a low crossover rate (six patients) which further validates its findings. Strong evidence supports that both physical therapy and operative treatment result in significant improvement in patient-reported outcomes for patients with symptomatic small to medium full-thickness rotator cuff tears. Moderate strength evidence does not support the routine use of acromioplasty as a concomitant treatment as compared to arthroscopic repair alone for patients with small to medium sized full-thickness rotator cuff tears. Moderate strength evidence supports the use of distal clavicle resection as a concomitant treatment to arthroscopic repair for patients with full-thickness rotator cuff tears and symptomatic acromioclavicular joints. 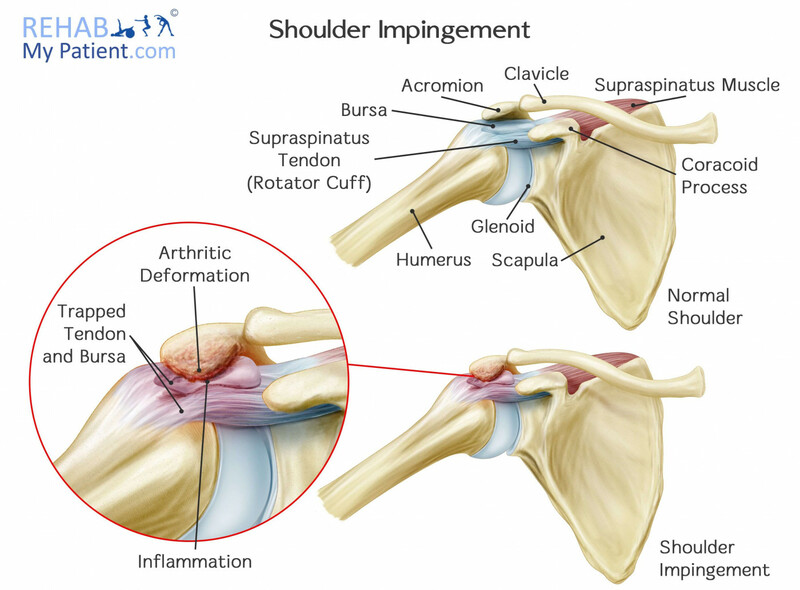 Impingement syndrome (also referred to as subacromial impingement and subacromial pain syndrome) is marked by shoulder pain that occurs on top of the shoulder joint beneath the acromion. The pain typically occurs when the arm is raised above shoulder level. See illustration of subacromial space. Patients with impingement syndrome and shoulder pain often have MRIs done. The MRI may show degenerative changes, partial thickness rotator cuff tears, and/or abnormalities in the subacromial bursa. These findings are also common in patients without shoulder pain. In Group 1, 21% of patients had not received surgery at 6 months. At 12 months, 16% had not received surgery. In Group 2, 11% of patients had received some type of shoulder surgery (non-sham) and 31% had not received any surgery (sham or real) at 6 months. At 12 months, 11% of patients had received some type of shoulder surgery (non-sham) and 22% had not received any surgery (sham or real). In Group 3, 11% of patients had received some type of shoulder surgery at 6 months. At 12 months, 24% of patients had received some type of shoulder surgery. Findings: Surgical groups had better outcomes for shoulder pain and function compared with no treatment but this difference was not clinically important. Additionally, surgical decompression appeared to offer no extra benefit over arthroscopy only. The difference between the surgical groups and no treatment might be the result of, for instance, a placebo effect or postoperative physiotherapy. The findings question the value of this operation for these indications, and this should be communicated to patients during the shared treatment decision-making process. This study showed that subacromial decompression surgery was no better than sham surgery for impingement syndrome. Both surgery groups were better than no treatment, but this is likely due to the placebo effect of surgery and/or the extra physical therapy that the surgical groups received. Over the course of the study, a significant number of patients did not receive their assigned treatment, but this was mostly due to subjects not having surgery which indicates that pain and function improved without intervention in a number of people. Only 11% of subjects in Group 2 were true crossovers (received non-sham surgery) at 6 and 12 months. A per-protocol analysis also found no significant effect of surgery. Its name comes from the fact that people who play racquet sports (like tennis) are prone to develop it from excessive backhands. Any excessive extending or twisting of the wrist (like turning a screwdriver) can cause tennis elbow. Doctors often give steroid injections into the tender part of the elbow to help relieve the symptoms. Physical therapy may also be prescribed. Physical therapy did not have a significant effect on long-term outcomes. The effect of physical therapy on short-term outcomes (4 weeks) is unclear since the control group had no intervention, and the difference seen may be attributable to the placebo effect. The best treatment for tennis elbow appears to be time. In this study, 83% of patients treated with placebo had much improvement or recovery at 26 weeks, and 93% were much improved or recovered by 52 weeks. 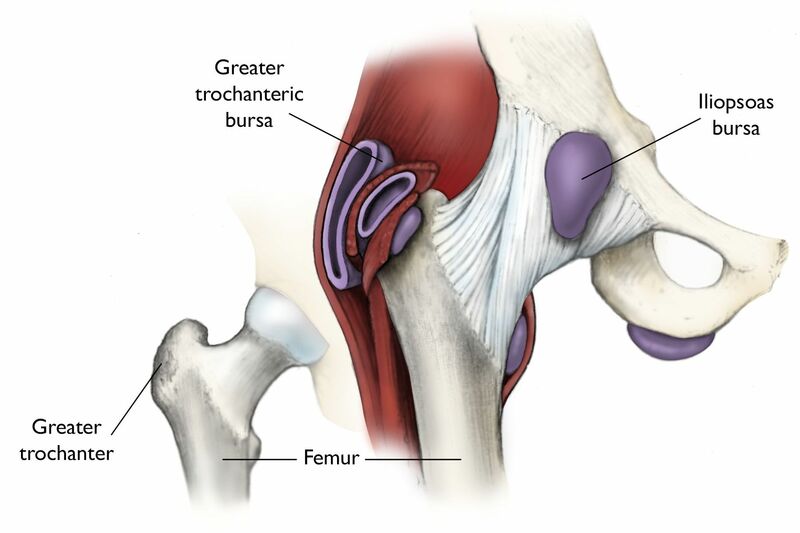 The greater trochanter has a bursa (fluid-filled sac) overlying its outer border that provides cushioning and reduces friction between it and the overlying tendon of the gluteal muscle. If the sac becomes inflamed (bursitis), pain can develop. Findings: For gluteal tendinopathy, education plus exercise and corticosteroid injection use resulted in higher rates of patient reported global improvement and lower pain intensity than no treatment at eight weeks. Education plus exercise performed better than corticosteroid injection use. At 52 week follow-up, education plus exercise led to better global improvement than corticosteroid injection use, but no difference in pain intensity. These results support education plus exercise as an effective management approach for gluteal tendinopathy. Steroid injections for trochanteric bursitis are a popular procedure in the U.S.
HIp replacements can fail over time and patients often want to know how long they can expect their replacement to last. Several studies have looked at the durability of hip replacements over time. Results from those studies are summarized in the table below.